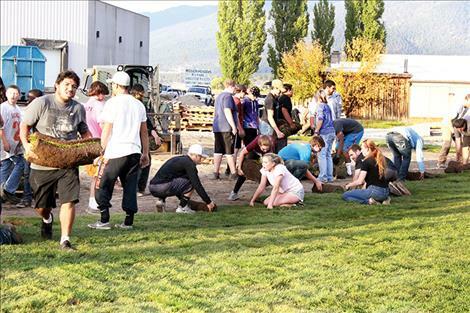 Ronan students put sod down at the Boys and Girls Club of the Flathead Reservation and Lake County last week at the new location where Total Home was once located. 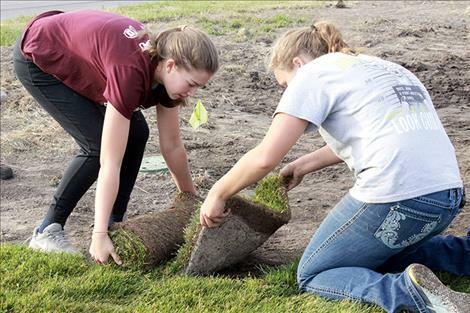 RONAN – This past week, Ronan High School clubs and sports members helped lay sod for the new Boys and Girls Club facility. It took only a few hours with so many helping hands working together, including volleyball, football, cross-country, Technology Students Association, National Honor Society and the yearbook group. This was big to be a part of because we took a piece of land that had nothing and turned it into a beautiful playground area, and we were giving back to our community. This project was special to many of the kids helping because they went to the Boys and Girls Club when they were younger. Some are even working there now. By doing this, they gave back to the place that gave them a second home, a place to learn, and a place to become. The Boys and Girls Club mission statement is “To enable all young people, especially those who need us most, to reach their full potential as productive, caring, responsible citizens.” I think that you can definitely see this in the work that was put into laying the sod. The kids that participated came because they wanted to help their community.